White paper on crime 2004 Part1/Chapter2/Section1/3. Fig. 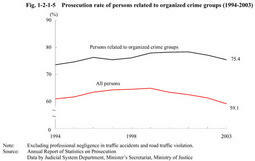 1-2-1-5 shows prosecution rate for total persons finally disposed and for such persons related to organized crime groups(regular members or quasi-members of a group with a tendency to commit illegal violent acts habitually or as a group;hereinafter the same in(1)of this subsection),over the last10years.In2003,prosecution rate for all persons was59.1%whereas that for persons related to organized crime groups was75.4%. Fig. 1-2-1-6 compares suspended prosecution rate for persons related to organized crime groups with that for all persons,for major offenses,in2003.Suspended prosecution rate for persons related to organized crime groups was far below that for total persons in such offenses as injury,assault,theft,and violations of gambling/lottery acts,Bicycle Racing Law,and Firearms and Swords Control Law. Table 1-2-1-7 shows the number of convicted prisoners related to organized crime groups and their proportion to total convicted prisoners over the last five years.The proportion of organized crime group members to total convicted prisoners was19.3%as of December31,2003.However,it was31.6%in the institutions for Class B prisoners with strong criminal tendencies. Among newly admitted convicted prisoners in2003,4,309(13.7%of the total)were identified as members of designated organized crime groups under the Anti-Organized Crime Group Law.Of them,1,213were group leaders,2,717were ordinary members,and379were unknown(Source:Annual Report of Statistics on Correction). Table 1-2-1-8 shows the10most common offenses committed by designated organized crime group members and by other prisoners newly admitted in2003. Examining the term of imprisonment of designated organized crime group members newly admitted in2003,most of them were sentenced to over one year but not more than two years(37.1%),followed by over two years but not more than three years(25.7%),over three years but not more than five years(13.9%),over six months but not more than one year(12.1%),over five years(8.1%,including imprisonment for life),and not more than six months(3.1%)(Source:Annual Report of Statistics on Correction). As for the age of designated organized crime group members newly admitted in2003,most of them were aged30-39(37.5%),followed by aged20-29(21.8%),aged40-49(20.5%),aged50-59(15.9%),and aged60or over(4.3%)(Source:Annual Report of Statistics on Correction). As for the history of imprisonment of designated organized crime group members newly admitted in2003,the highest was"the first time"with30.1%,followed by"twice"with18.9%,"three times"with14.4%,"four times"with10.2%,"five times"with7.8%,"six to nine times"with14.7%,and"10times or more"with3.9%(Source:Annual Report of Statistics on Correction). Correctional institutions provide guidance for organized crime group members to acquire well regulated daily lives and working habits,and positively encourage them to leave their organized crime groups with the support of the police and other authorities.While allotting work and rooms to them with special care,correctional institutions take necessary measures to maintain strict discipline and order in the institutions by housing them separately in the same institution or transferring them to other institutions. Fig. 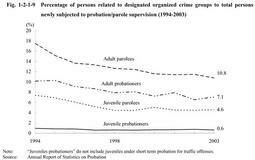 1-2-1-9 shows the percentage of probationers/parolees who are considered to have a connection with designated organized crime groups under the Anti-Organized Crime Group Law to all probationers/parolees at the time of admission to supervision over the last10years. The categorized treatment system(see Part2,Chapter5,Section3-3 ,and Part5,Chapter5,Section4-1 )regards the following probationers/parolees as"persons related to organized crime groups":(a)those who are leaders,members,and quasi-members of organized crime groups;or(b)those who previously fell under(a)above and are not considered to have left the groups completely.For those probationers/parolees in this category,in cooperation with the police and prefectural centers for promoting violent-expulsion movement,efforts are made to understand the reality of their daily lives and provide them with intensive guidance and assistance in order to encourage them to leave their crime groups and establish stable lives with decent jobs. The Anti-Organized Crime Group Law regulates designated organized crime groups and alliances of designated organized crime groups,which are collectively called designated organized crime groups,etc.However,all of the24organized crime groups that have been designated by December31,2003,are designated organized crime groups.The Prefectural Public Safety Commission decides such designation through specific procedures such as holding public hearings or requesting the consent of the National Public Safety Commission. The Anti-Organized Crime Group Law prohibits some acts that have not been regulated under traditional laws and regulations,such as violent acts of designated organized crime group members demanding money or goods from citizens by flaunting the threat of the designated organized crime groups to which they belong.The Prefectural Public Safety Commission may issue orders to stop such acts against those designated organized crime group members who have committed such illegal acts or to take necessary actions to stop them.These orders are called"stop orders,"and a person who violates such order is sentenced to imprisonment with labor or to fine. Additionally,the partial amendment of the Law in1997provides that a person who has some relationship with a designated organized crime group but is not a designated organized crime group member shall also be subject to a stop order,as having committed a quasi-violent act,if he demands money or goods from citizens by flaunting the threat of the designated organized crime group to which he is related. In cases where designated organized crime group members have committed acts that are prohibited by the Anti-Organized Crime Group Law and where there is a possibility that they will repeatedly commit similar acts,the Prefectural Public Safety Commission may issue orders,which are effective for a certain period within one year,for necessary actions to prevent such acts.These orders are known as"recurrence preventive orders,"and a person who violates such order is sentenced to imprisonment with labor or to fine.Moreover,under the partial amendment of the Law in1997,quasi-violent acts are also subject to recurrence preventive orders.